Here are some improvements in SQL Server Integration Services 2012 from SQL Server Integration Services 2008. The Tasks and Transformations can be grouped together. You will not be using this Group to connect to other Containers or Tasks. This grouping is just for arranging the Tasks or Transformations but you will not be able to set the properties like Containers. In earlier versions of SSIS, to change the scope of variable from one Task to another Task or from Task level to Package level, we had to delete the variable and then create with new scope. In SSIS 2012, we can change the scope of variable without deleting and recreating it as shown below. We often have to write expression in Execute SQL Task for source query. The character limit for SQL Server 2008R2 and old version are 4000. This limit is removed in SQL Server 2012 Integration Services. 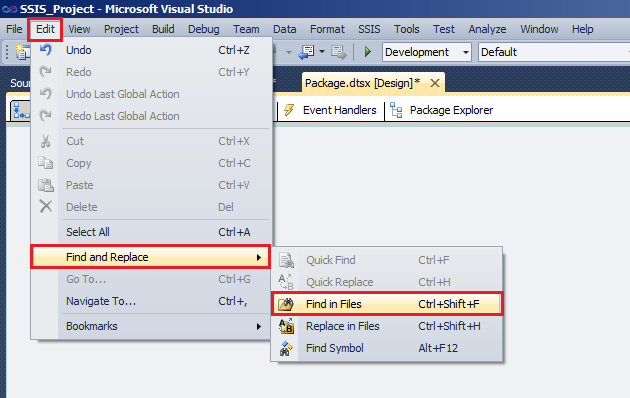 SSIS ToolBox and Variables buttons are added to Package Design Surface as shown below. For Zoom in and Zoom out a scale is added at the right bottom corner of Package design surface. 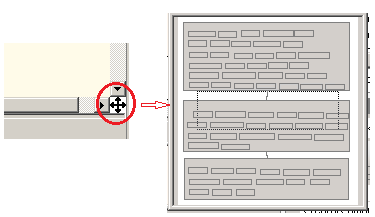 Also the Button for navigation button is removed that was available in right bottom corner of Package design surface in SSIS 2008R2 and old versions. With new Project Deployment Model, Parameters are added to provide configuration values. The Parameter can be on Project level or Package level. We can change the value of these parameters without making any change in Package or Project itself while Package is going to execute in different environments such as DEV, QA, UAT and Prod. Parameters can be accessed by Right Clicking on Tasks, Containers etc. You will also see the Parameters while writing expressions and you can use them if required. 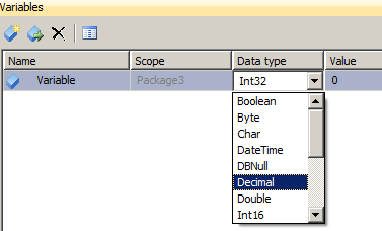 When you create a new Parameter, you can Add to Configuration as well from SQL Server Data Tools. Below are the newly added functions which can be used while we write expressions. Row Count GUI is simplified, The purpose of Row Count was to save the Count in user variable but Row Count Transformation in SSIS 2008R2 and earlier versions were also displaying all system variables. In SSIS 2012, it only displays the Variables which are Integer Type and does not provide the list of all variables that helps to configure this Transformation quickly. Extra features of Data Viewer are removed such as see the data as Histogram,Scatter Plot and Column Chart. I have been always using Grid and never used other types and specially for debugging other charts really does not help. In SSIS 2012 , Only Grid is available and other types are removed. New Graphical User Interface is provided in SSIS 2012 for Pivot Transformation to configure it quickly and easily. Click Link to see example of SSIS 2012 Pivot Transformation and how to use it. ODBC Source and ODBC Destination is added in SQL Server Integration Services 2012. 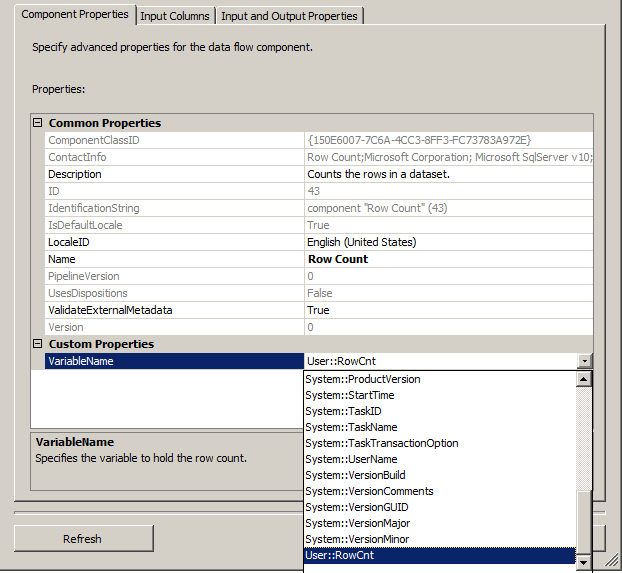 The CDC Control Task is added to SSIS 2012 to perform initial load for CDC enable table. CDC Source is added to read the change data from CDC tables. CDC Splitter Transformation is added in SSIS 2012 to split the data into multiple flows for Insert, Update and Delete Operation. We often have to debug Script task which we have used in our SSIS Package. We use MessageBox.show to see the value of variables and then have to hit Ok to see the next value. Instead of introducing Message Boxes for debugging we can use Break Point and debug step by step so we do not have to worry about removing the Message Boxes or commenting them after debug. In case we forget any of them that can become the reason of package failure when we will be running the package from SQL Server Agent. Let’s jump into an example, how to debug Script Task step by step by using Break Point. In this sample Package, I am reading the file names from a folder. I have created a Variable FolderPath in SSIS Package and passed this variable to Script Task. Script Task uses this folder path and read the file names. First, I want to make sure the Script task is reading the correct value of FolderPath variable and then want to know what file names are read from Folder? Drag Script Task to Control Flow Surface, Open it by double clicking and then provide the FolderPath variable to it and Click on Edit Script. I am using C# for scripting, you can use VB.Net if you like. Add using System.IO under namespaces and below code in Main. The code is going to read the .txt files from the Folder which is provided by FolderPath variable. Hit the Save button and close the Script Task Edit window. You will see that the Script Task has Red Circle that means Break Point is added to the Script Task. Let's execute our SSIS Package and see how we can debug the Script Task and see the values of variables etc. As we can see the Script Task is stopped at Break Point. Once you hit F10 or F11 , the next step will be highlighted and executed as shown below. As you can see in the fig 6, we can click on the line and it will show us the value. you can unpin or pin to see or hide the values while debugging. Once the Script Task execution is completed, the package will return to run next task in Control Flow Surface. If all looks fine to you. Open the Script Task and Click on the Break Point to remove it. 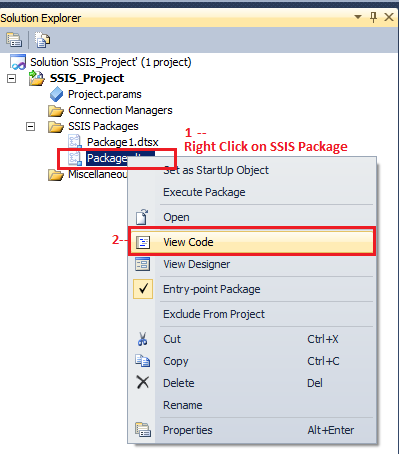 As we know that we can copy Connection Managers, Tasks and Transformations between SSIS Packages but how would we copy the variables from a SSIS Package to another SSIS Package. This can save us time while development in cases where we need to create variables with same name and data types. SSIS - How to Find An Object ( Table,Function or Stored Procedure etc.) If It Is Used in SSIS Package/s? On daily basis we come to the point where we want to know if the table/view is used in a stored procedure or function. Same way while debugging SSIS Package we need to know if the SSIS Package is using table or Stored procedure so we can further look into the issue. The very first thing came in my mind, open an SSIS Package, Press Ctrl+F or Ctrl+H and see if something show up like the way we find and replace in SSMS or MS Office products. Unfortunately, that does not work in SSIS Package. So how do I find if the Stored Procedure is used in my package? The SSIS Package files are saved as xml file. Open all the SSIS Packages in which do you want the stored procedure in BIDS or SSDT. In my case I have already opened two SSIS Packages. 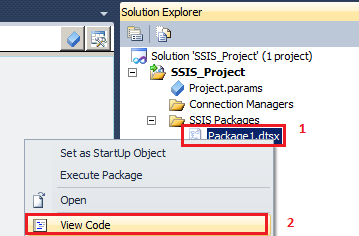 Put the object name or text that you want to find in SSIS Package. Fig 4: SSIS Package Find Results Pane. As we can see that the both SSIS Packages are shown in Find Results with Task where dbo.Test is found. To initiate Find Wizard, in Solution, we need to use Ctrl+Shift+F.